FILE - Villagers hold fish-shaped signs and placards while they pose for photographers at Thailand's Administrative Court in Bangkok, June 24, 2014. environmentalists say they fear the impact of increasing numbers of proposed dams on the region’s river systems and communities, especially along the Greater Mekong River. More than 500 delegates from over 50 countries attended the International Water Resources conference in Vientiane, Laos last week focusing on water resources and hydropower development across Asia. The conference centered on the development and engineering of regional hydropower with China, India, Russia, Malaysia and Pakistan boasting some of the largest dams and power plants globally. But environmentalists fear the impact of increasing numbers of proposed dams on the region’s river systems and communities, especially along the Greater Mekong River. A view of the Kamchay hydroelectric project in Kamport province, 146 km west of Phnom Penh, March 22, 2008. Among the highlights was Asia’s potential in developing clean renewable energy, with the associated water storage seen as providing benefits to local communities. In an address to the conference, Naruepon Sukumasavin, the regional intergovernmental Mekong River Commission director of planning, said hydropower was recognized as an “important development opportunity” for the region. But Naruepon said the accelerating pace of hydropower development also posed challenges for regional cooperation. According to conference documents, Laos, one of the poorest nations in the region, is moving forward with the construction of over 350 hydropower projects with private sector backing and will add more than 26,000 megawatts of new capacity to the regional grid. 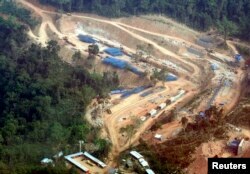 Laos has already been engulfed in controversy over construction of the $3.8 billion Xayaburi dam in northern Laos along with the planned $600 million Don Sahong dam for the Siphandone (Khone Falls) in Chamapasak province, just two kilometers upstream from the Lao-Cambodia border. 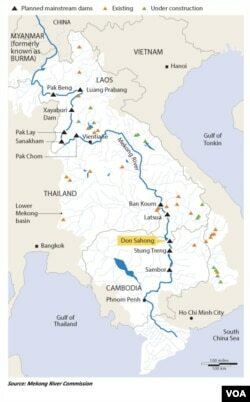 Environmentalists say the Don Sahong dam will damage vital fisheries while Vietnam raised alarm over the dam’s impact on water flows to the Mekong Delta, the nation’s rice bowl and home to 20 million people. Laos said some 50 projects of around 4,000 megawatts are being implemented largely for domestic supply while more than 20 schemes are in the pipeline for electricity exports totaling 15,000 megawatts. Agreements, the government says, have already been signed with Thailand covering the purchase of 7,000 megawatts of power. But activists, such as Premrudee Daorung, coordinator with Project Sevana South East Asia, says the high profile role of the private sector undermines the ability of local communities to raise concerns over the impact the dams will have on the environment. Premrudee said the concern is the region has entered an era of “big investment” in water resources led by the private sector rather than the government, a trend she describes as “very dangerous”, especially on issue of public accountability. Australian international lawyer professor Ben Saul from Sydney University, co-author of a book assessing the role of international agreements in settling the environmental debate for dams in the Mekong Region, said the outlook to monitor dam development is “pretty bleak”. “Yes, they’re never going to stop dams and I think that’s fantasy land at this point in any country apart from Thailand to think that dams will just stop as a result of [treaties]. But [the law] leads to improvements in resettlement programs, better compensation for villages, if it leads to fish ladders being installed even if the fish can’t swim up them – at least there is more attention to environmental problems,” he said. Dam construction in the Mekong River region remains a highly polarized debate. Groups such as the International Union for the Conservation of Nature and the World Wide Fund for Nature (WWF) are warning of the impact on communities and local food supplies affecting millions of people across the region. 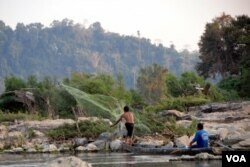 But the Lao government says it remains committed to what it terms developing clean, renewable hydropower.